Avilius (left) is rated a real chance. MARK Zahra and Glyn Schofield will miss Caulfield Cup after being hit with 10-meeting suspensions for careless riding at Flemington on Saturday. Both have three days to decide whether to appeal the bans, which are set to begin at midnight next Saturday to allow them to compete next Saturday in the Everest or Caulfield Guineas. Zahra's ban came after stewards ruled he had shifted out without care on Krone in the Manifold Stakes, while Schofield's suspension came for his mid-range careless riding on Avilius, the winner of the Group 3 Bart Cummings. 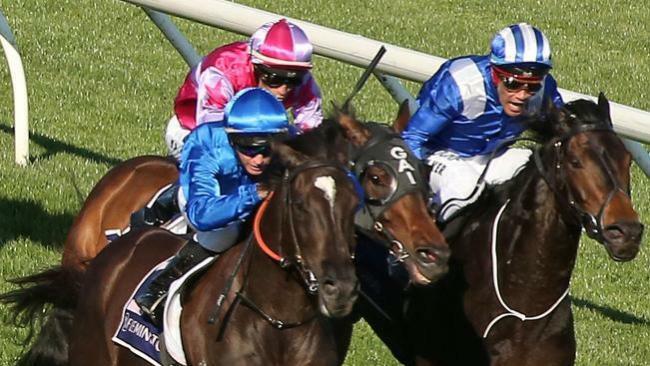 Jye McNeil was hit with a nine-meeting suspension - which he dubbed "a bit steep" and said the mid-range grading too harsh - and chose to start his ban after next Sunday's Cranbourne Cup. Young jockey Ben Allen was hit with a $750 fine for excessive whip use on Trap For Fools.